i found some unexpected behaviors of the screencast keys addon. when you hit in editmode the i-key twice to inset face individual, it seems the screencast keys view shows only 'i' once. when screencast_keys_mouse mode is in icon-mode, it does not show modifier-keys that where holding down at mouse-button press. in text-editor, all the keys you type in are shown as well in screencast keys view, but i think there it is not needed to show keys, you can see typing in live in realtime. when you use object modification short-cuts with typing in a value of the amount of that modification, the screencast keys view does not show the typed value. "Start Display" screencast keys on 3d view on N-sidepanel. ->> the screencast keys mouse-icon shows only the RMB pressed, but there is no modifier-key shown. suggestion: why not show an iconic modifier-key for that. while typing in text to the editor, the screencaste keys view shows up all typed letters/words/keys, you can see in the editor at all. with an object selected, hit s-key to cale, hit z-key to limit to an axis an type in 0.5 as amount of scale. Alexander N. (beta-tester) raised the priority of this task from to Needs Triage by Developer. Alexander N. (beta-tester) added projects: BF Blender, Addons. Alexander N. (beta-tester) set Type to Bug. Alexander N. (beta-tester) added a subscriber: Alexander N. (beta-tester). ->> the screencast keys shows only 'i', but it should show 'i x2'"
^^ is not really a bug, i key cannot be pressed twice in edit mode as you need to move the mouse to inset before the next keystroke. 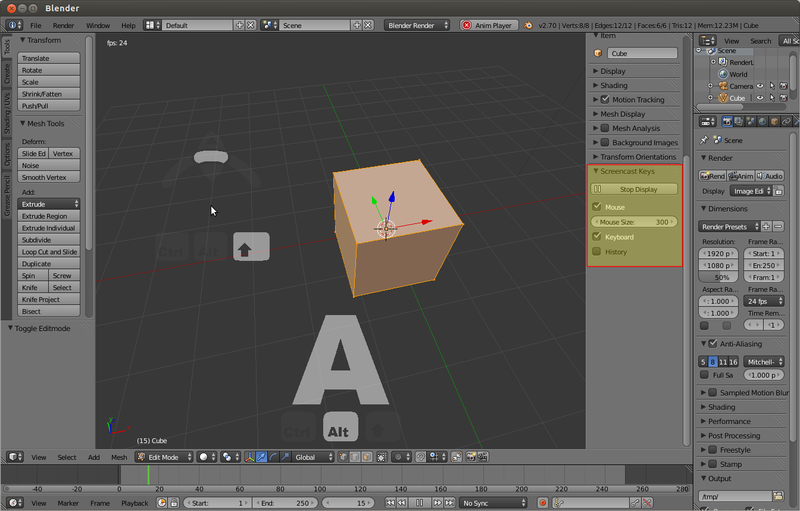 It's likely that Blender takes over operation of the 3dview during this exercise. Possibly more of a limitation than a bug. ->> the only pressed keys you see in the screencast keys view is the 's'. you don't see the 'z' and not the '0.5'"
^^ Certainly with the above example, I can see issues for tutorial writers. Again, I would suggest this is a limitation. It appears Blender holds the keystroke, eg "s", "g", "r", (running modal rings a bell, but may be wrong..) until the direction & limit/numerical input has been set. so the addon only receives the initial call to 's", "g", "r"
This happens in both Object Mode & Edit Mode & may also be related to the Edit Mode 'i', 's", "g", "r" & other similar calls. 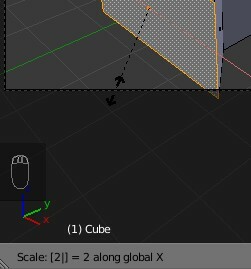 Please Note: Whilst the screencast addon does not show these calls, if your 3d view header is set to the bottom, the axis & dimension (direction & limit/numerical input) is viewable. It would seem, when used this way, in conjunction with Blender ui, the limitation on this script is solved? Teachers and tutorial writers are the main- if not sole- user group that need an addon like this. The purpose of screencasting clicks and key strokes is so that a viewer who is new to Blender can know- at all times- exactly what buttons the instructor is pressing. So, if a limitation of the screencast keys addon presents an issue for tutorial writers, then that is a drawback to the addon as a whole. @Brendon Murphy (meta-androcto) : Your workaround requires that the viewer has a strong enough understanding of Blender's interface that (s)he infers keystrokes from the addon in certain contexts, but then not in other contexts. But that defeats the core purpose of the addon. Advanced keystroke sequences like Shift+D, Shift-Z, Ctrl, left-click are actions where this addon is needed most. But if I wanted to perform this action and actually demonstrate to my students how to duplicate an object, constrain it to the X Y axes, snap it to the grid and place it, as it stands they would only see "Shift+D", and then the addon goes quiet. With the obvious exception of entering long strings of text in a text window, the screencast keys addon should screencast all keys. It should not stop screencasting keys during transformations (which is exactly the sort of context where seeing keystrokes is very important). @Brendon Murphy (meta-androcto) : the main purpose (and only?) of the screencast keys addon is to teach/show people the handling of blender - those people in general do not know all the Details, where else they can find subsequent actions on the screen. and specially if you don't sitt in the first row in the room, you will have problems to look/observe all these actions showed somewhere on the userinterface on maybe a tiny Label/TextBox, when it is presented via a beamer to the wall. the eyes of the people have to know, when where to have to look that will be very hard or impossible for people who has not knowledge of blender. if people do not have knowledge of blender, thier eyes should easely stay focused to the main cast keys field to get all neccessady Information and the model. I do understand the problem well, iirc this issue was brought up/attempted/discussed when the screencast addon was in development. There was no easy answer then, there was a problem drawing in the 3d view at the same time as some blender internal calls. I don't know if there's an answer to this now. In the past Tutors & like minded people have seen value in this addon & helped keep it alive. Currently there's not much dev interest in fixing/updating & such. I'm sorry about the "known limitation". "no devs" type answer, personally I really like screencast keys, but it's not/never been perfect. The workaround is just incidental, screencast draws to the bottom left, so does the scale, although not as visible. Another workaround would be to point users towards the s,r,g, message, it's handy to know. Currently as the addon is now more recognized to be inconsistent, buggy & unusable in some situations, It will be my recommendation that the screencast keys addon be removed from release & moved into contrib addons. It's still useful in many situations & should not be discarded entirely as in contrib it's still accessible & open to future development. In the event that a developer fixes & upgrades screencast, in my opinion, it would be a welcome return. Keypresses from a text window are getting registered. Keypresses done during transform are not reported by Blender, hence it's impossible for the addon to capture them. Only alphanumeric characters do have graphical representation for the keyboard combos (arrows and other non-alphanumeric keys haven't been included, though must be trivial). Number of repetitions for the same key combo is not yet shown (internal system is already able to detect repetitions, only missing part is drawing it). Implement better behavior for mouse display; just following the pointer doesn't seem to be a really good idea. Please let me know if you think this rewrite is a good candidate to be considered for replacing the old version. Thanks for the update, it might be better to somehow publicly release this. I'm not sure if the current limitations are a showstopper. I'll test & ask about contrib, but more likely it will no longer be in Blender. Closing this task for now.